Hello! I hope you had a great weekend and your week is off to a great start. I went to Knoxville last weekend to visit my granddaughters. My 7 year old granddaughter, Taylor, had her tonsils and adenoids out last Thursday and I wanted to give my daughter a hand with her. Taylor has been very rebellious in taking her medicine. I'm afraid that she takes after me in that she can hardly drink gross stuff. Bless her heart. All of her medicine is liquid and none of it tastes good. She always feels much better when she gets it down but it is so stressful trying to drink it! 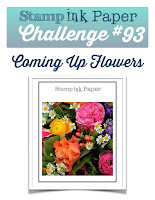 Well since it is Tuesday, that means it's time for another Stamp, Ink, Paper Challenge and this week it's all about flowers. How fun is that?? 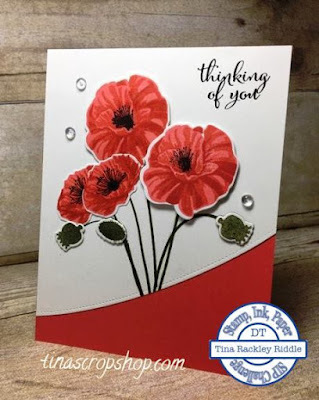 I just received the awesome Hero Arts Color Layering Poppy Stamp Set so it was time to play! This was such a super fun stamp set. The colors that I used to layer were Stampin Up! Flirty Flamingo, Melon Mambo and Watermelon Wonder. My cardbase was Stampin' Up! Watermelon Wonder Cardstock. The top layer was Neenah Classic Crest Solar White 80# Cardstock. I stamped the stems directly on the white layer with Stampin' Up! Mossy Meadow Ink (retired). I added my stamped and die cut layers with Tombow Multipurpose glue and foam tape. I used one of my Mama Elephant Borderlines Trio Creative Cuts to cut a stitched curve on the bottom of the top layer before I layered it on the Watermelon Wonder Cardstock. I added three Pretty Pink Posh Dew Drops with some Ranger Multi Medium Mat Adhesive.